From looking at that picture I'd be tempted to think we were making cookies today, but we're not. These little cuties are solid shampoo bars. With summer and vacation time quickly approaching, you might want to consider popping one of these travel-friendly shampoo bars into your bag. And guess what, they're super simple to make. The dry surfactants in these are coconut-based, and there are a couple of hair conditioning goodies added so you won't need any additional products to cleanse and condition your hair while traveling. OK I have a confession to make. You don't need to have a vacation planned to make and use these bars - they're great to use at home as well. 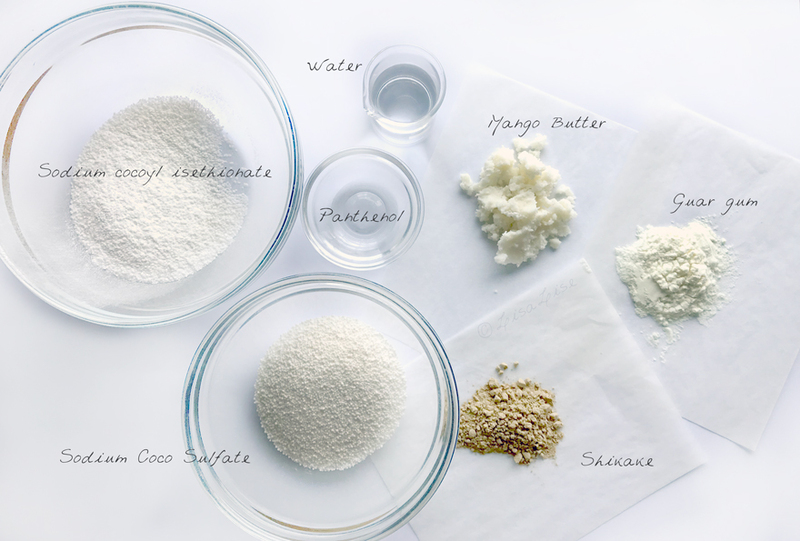 Are you ready to get busy making shampoo bars? This amount will make 4 guest sized soap bars - just enough for you and a friend. 4. Add Phase C ingredients and mix well. 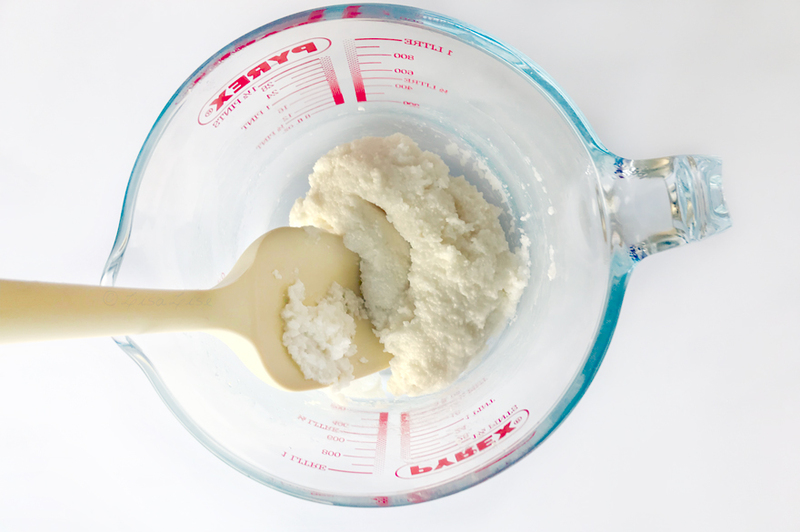 The mixture will become a dough-like mass that is easy to handle. 6. Unmold and let dry at room temperature until hardened. Depending on the climate you are in, this can take from 2 to 7 days. 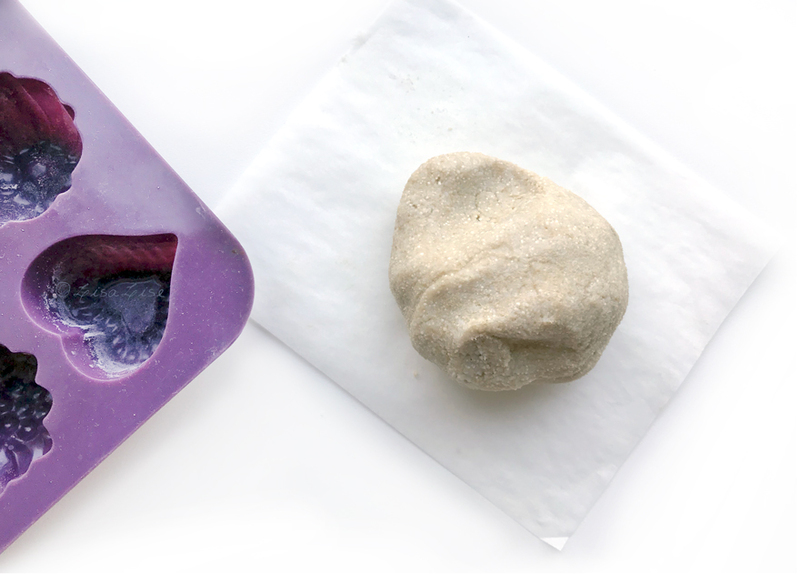 Using a shampoo bar is just like using a bar of soap: wet and rub the bar between hands to work up a lather. Apply the lather to hair. Rinse. Rejoice! I was inspired to make these after trying (and loving) the Rosemary Shampoo Block from this tutorial by Botanical Formulations. Click the link for even more shampoo bar fun! Have you ever made a shampoo bar? Please share your favorite shampoo bar ingredients in a comment. Hi Olympia! Absolutely agree! 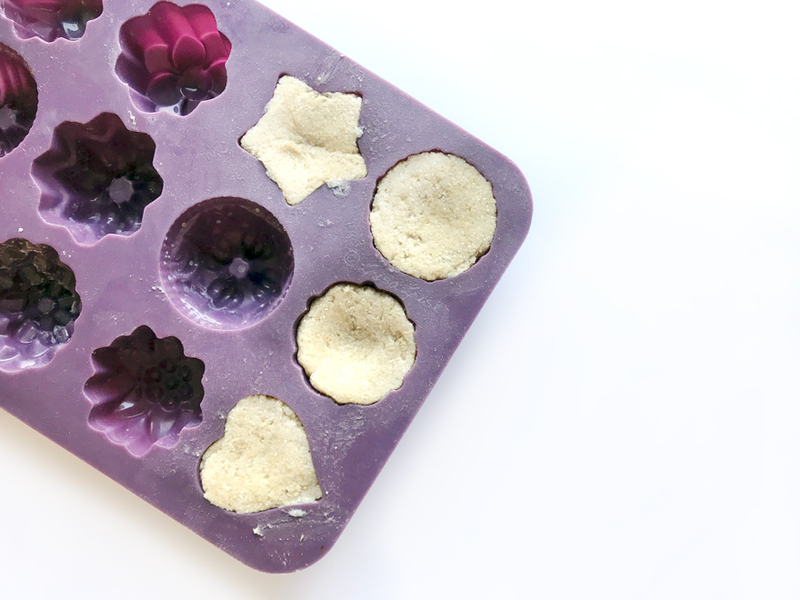 Shampoo bars are fun and so easy to customize! Hi Lisa! I tried shampoo bars when I started DIY my cosmetics a few years ago but they made my hair heavy and I gave up. I'll try your formula! Is shikake the same as shikakai? This is really exciting! I've been wanting to try a shampoo bar for a while but have been put off by overly complicated recipes and undesirable ingredients. Yours looks great :) Couple of questions- I've seen other recipes using preservatives, are they not necessary or is it because these are small 'one-use' type bars? I don't have shikake powder, would clay work as a substitute or will it be problematic to preserve? Thank you for such a brilliant blog, it's always my go to website for any new project! Hi Nic — Thanks for your kind words! You can leave out the shikake if you want - just use more guar. There is no preservative because the water evaporates as the bar hardens and - much like a bar of soap - no preservative is necessary. Have fun! 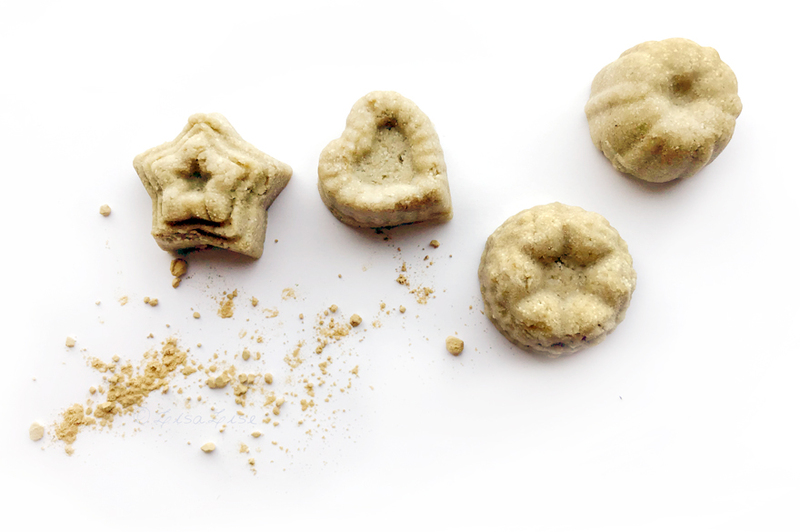 Do you know the final PH of these shampoo bars? Is there a butter I can sub for mango? I'm would like to streamline all my ingredients that I use to make soap and lotion bars with already. Mainly cocoa and Shea. Thank you for sharing. What could be used in place of panthenol? and can xanthan gum be used in place of guar? Thank you. HI Tachan - You should be able to substitute the mango butter with a 50/50 mix of cocoa and shea - give it a go and see what you think! Hi Aish - You could try and up the guar amount to replace panthenol - or maybe add some silk protein. I wouldn't replace the guar with xanthan as the guar is part of what's giving you the conditioning action. Great recipe! I’ve been dying to try shampoo bars for awhile now, could I sub the SCS for Coco b? Since that’s what I have on hand with the SCI...I am assuming I would have to up the amount of SCI to compensate for the extra liquid…love your blog!! hi lise, fab article as usual. can i ask where you sourced the scs from and also how possible it is to create a shampoo bar without sulfates? thank you. Hello! Can't wait to try and make these. I am wondering how you know what level of heat to melt over? And the best tools needed to melt (do I need to buy a hot plate? Should it only reach a certain temperature when melting? Hi Anon - Always melt butters slowly over very low heat and babysit them until melted. Then remove from heat immediately. Some people prefer using a water-bath (bain marie) as this gives good control. Have fun! Hi Presh - Thanks for your comment. SCS is available from most cosmetics ingredients suppliers. You didn't mention which part of the world you are in so my best recommendation is to check with your local supplier of ingredients or order from a company that ships worldwide. As for sulphate free bars, you are talking about a cold-processed soap-type of shampoo bar for this kind of solution. Hi Sophie - I think you might get a somewhat longer drying time and may even risk the bar not hardening up completely. Try a small batch at see if it works.. and expect a longer drying time. I'd love to hear how it turns out for you. I made this shampoo bar..It was lovely to use, but the problem I faced was that when I tried to make it, I think the water wasn't enough as it clumped up when I heated it.So the bar didn't come out smooth...Since some of the water evaporates when we heat..how do I compensate for that water loss? The only change I made was that I substituted shikakai powder for guar gum like you mentioned in the comments. And if I add some citric acid solution to this mixture can I lower the ph from 6.5? If so,can you please let me know a starting point? Hey there Unknown - It sounds to me like you heated the water? Do I understand correctly? It isn't necessary to heat the water - only the butter just enough to melt it. The mixture needs to be worked together as soon as all the ingredients are in the bowl. Wearing latex gloves will allow you to work everything together by hand. You can lower the pH by adding a few drops of citric acid solution to the water before adding it to the mix, then test the mixture. Can you confirm with type should I buy to make shampoo bars ? HI Tracy - Great question! I've worked with both (and you could in all likelihood do the same) but I just checked my notes and the ones in the book were made with Cyamopsis tetragonoloba (Guar) gum. :) Now of course I must make a batch using guar from another supplier to test this in shampoo bars! Where do you get demineralised water? Can I sub in distilled or bottled water? Hi! I tried this recipe using SCI that is more like pellets than a powder (this was all I found to order). It didn’t dissolve very well - is that because it didn’t work it in fast enough? Any other suggestions? Thanks! Oh, and can I lower the ph with lactic acid?